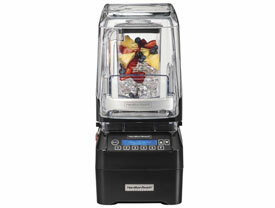 Our quietest commercial blender also provides our best drink consistency. Thanks to our unique QuietBlend™ Technology, you can serve your customers super-creamy drinks without disturbing their conversations. Patented Wave~Action® System Ordinary blenders spin contents around the walls of the jar, which can leave whole chunks untouched by the blades. The Wave~Action® System has a unique container and blade design for a super-creamy profile every time. Standard: Unit comes with base, one 48 oz./1.4 L container, Quiet Shield™ sound enclosure.